This post continues our series showcasing how remodeled church buildings can support a church’s vision for ministry. Sometimes, church leaders may take their church building for granted, forgetting that it can send a powerful message to guests (as well as regular attenders). The fact is, if a building’s implicit message seems outdated or unwelcoming, people might stay away. This tendency to stay away is particularly true for youth. Young people are sensitive to what may seem like a “token gesture” made by adults which actually was made with the best of intention. 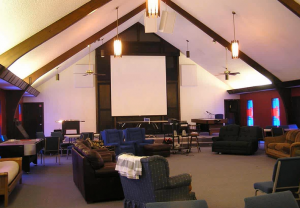 For example, we’ve seen some churches build a new worship center and then give the old one to its youth group. There’s nothing wrong with that, but how you do it can really make a difference. As you can see in these first pictures, Westerville Christian Church is one such church. They built a new worship center and repurposed the old one for young people, at first hanging a simple sign over the entrance and furnishing the old worship space with chairs and couches. But its leaders realized that their church vision of reaching youth would be a lot more successful if their church design sent a strong welcoming message. Instead of giving them “leftover space,” Westerville set out to create a design that would attract and connect with young people. To do this, they turned to The McKnight Group for assistance. 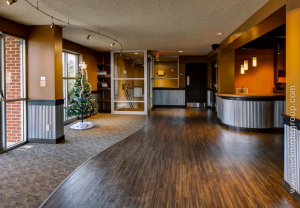 As you can see here, we transformed what was a small, closed-off foyer into a bright, welcoming space, adding fresh flooring and cool modern finishes. 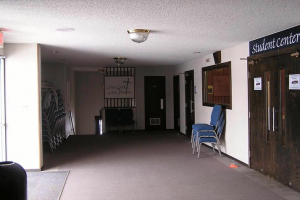 The foyer now leads into the worship space through an open area instead of closed doors. We also worked with Westerville to create a design for the worship center itself that would be appealing to youth. While the old space was OK for hanging out, it didn’t really support the vision of a compelling area for young people to help bring them to Christ. To do that, we transformed the old worship center into a space with youth appeal, adding a high-quality sound system, a platform large enough for a band, and folding chairs that increase flexibility for how the space is used. 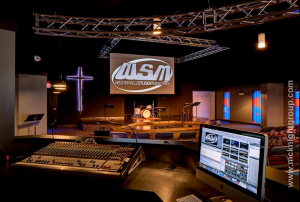 With these relatively straightforward renovations to an existing church design, we gave Westerville a powerful tool for fulfilling its church vision of reaching youth in the community. Church leaders need to notice how methods change and stay ahead of trends to get that message across. Westerville Christian Church did this by paying attention to what its youth were looking for in a church building. We, too, recognize that methods change over time, which is why we freely share our i3 webinars each year. This free series helps church leaders keep up with what is happening in church building projects around the country. Please go to our home page and sign up for any of our upcoming webinars. And come back for our next post, when we’ll provide another example of a successful church remodeling project: this time, transforming a school into an attractive functional church building.